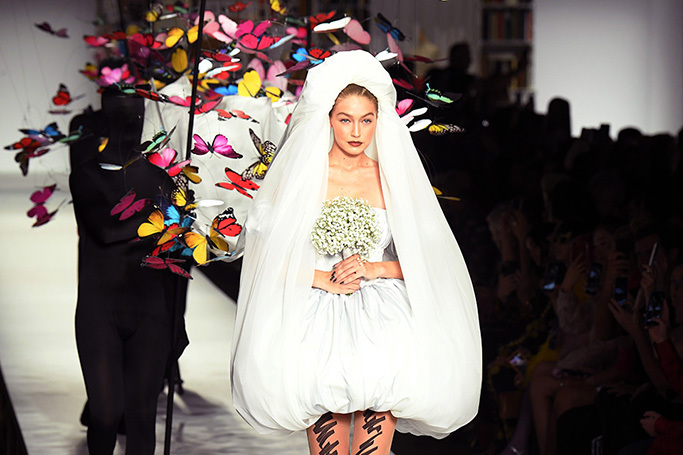 Milan Fashion Week SS19 has been a dream –just like the fantasy bridal gown Gigi Hadid wore to close the Moschino show, which was beautifully carried by butterflies. With an artistic collection, as dreamy as ever, Moschino Creative Director Jeremy Scott sent models, including Kaia Gerber and Kendall Jenner, down the runway in outfits which resembled paper dolls with scribbles and cut out accessories. The show was closed with a look that surpassed all others as the runway became an aisle for supermodel Gigi Hadid to glide down. Gigi wore a reimagined bridal gown with a bubble-hemmed minidress design and an over-the-top trailing veil. Hadid’s legs were clad in scribbled tights, and her veil was lifted elegantly by vibrant cartoon-like butterflies.